2016 has been a pretty bleak year for tablets. Shipments were down more than 12% compared to 2015 according to analysts at IDC, and innovation has been in short supply. Sure, the iPad Pro 9.7 appeared and Amazon upgraded its super-cheap Amazon Fire slate to make it even more of a bargain, but that’s pretty much it. Google’s share has been eaten into by new Windows 10 efforts, and even market leader Apple has seen sales drop 9.2% year-on-year. Don’t worry though, things are looking up as 2017 is already shaping up to be the turning point for tablets. Why? Well, the line between laptop and tablet is continuing to blur and IDC is predicting big things in the 'detachables' market, where tablets with keyboards will be the thriving sector. That potential success is backed up by predictions of a new Chrome/Android hybrid operating system, dubbed Google Andromeda, coming to replace the search giant's tablet platform - so here's what we expect to make an appearance in 2017. It's not hard to guess which tablet will get the most headlines in 2017: the new iPad Pro. Not content with already offering three different size tablets, Apple is reportedly bolstering its 7.9-inch, 9.7-inch and 12.9-inch collection with a new 10.5-inch tab according to a couple of recent leaks, by trimming its currently-oversized bezels. The iPad Pro 2 will reportedly use an upgraded A10X chipset (compared to the A10 that powers the iPhone 7), and that power will be paired with the usual trio of 32GB, 128GB and 256GB storage options. Prices are still unclear, but we’d expect a similar cost to the original iPad Pro, which means the base 9.7-inch model is likely to come in at around the $600/£550/AU$850, with prices rising to over $1,100/£1000/AU$1,600 for a full-spec 12.9-inch model. We’d suggest keeping an eye out for news of Apple’s annual March event for a potential first sighting of the new slate. Given its past successes in selling low-cost tablets, Amazon is likely to update its entire fleet of digital slates in 2017. The Amazon Fire HD 10 might be the high-spec option, but it’s the reworking of the entry-level 7-inch Fire tablet that should get you excited. Why? Well it all comes down to price. The past couple of models have circled the sub-$50/£50 (around AU$65) marker, and that’s going to be really attractive for those that are wondering if a tablet is a worthwhile investment. Promising leaks and speculation are still in short supply, but what we’d really like to see is that 7-inch display finally make the jump to a 720p resolution. The new Fire tablet is never going to have the strong spec list, but given its price tag it’s still an exciting tablet we want to see unveiled. An annual update cycle would see the 2017 Amazon Fire tablet making its debut around September. After the burning Galaxy Note 7 fiasco, Samsung will be looking to reinvigorate its reputation in the larger-screened device market. 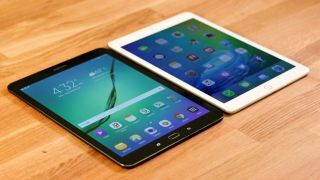 The South Korean brand is reportedly working on a couple of new tablets, with the Samsung Galaxy Tab S3 and high-end Samsung Galaxy TabPro S2 both expected to make appearances in the coming months. The Tab S3 will reportedly come in both 8-inch and 9.7-inch forms, just like the Galaxy Tab S2, with either the S7’s Exynos 8890 chipset or the lower-end Snapdragon 652 tipped to run the show, alongside Android 7.1 and another stunning AMOLED display. The 12-inch TabPro S2 has been rumored to have strong speed and camera updates, while retaining its Windows heart. Based on the original TabPro S, however, what we’d really like to see is a more robust, ergonomic keyboard base. With as-yet-unannounced Samsung tablets having recently passed through FCC testing in the US, a release could be imminent. CES 2017 runs the first week of January and would be an ideal time to unveil them, so one of these could be the first new tablet of 2017. It’s been well over a year since Apple updated the iPad mini, and even though the smaller tablet market isn't exactly thriving at the moment we still expect Apple to refresh its smaller slate range at least one more time. The iPad mini 4 offered a decent step up from the iPad mini 3 when launched in 2015 and similar improvements are expected in 2017. Although we’d like to see the iPhone 7’s A10 Fusion chip - or something even faster - run the show, the mini 5 is more likely to see a chipset from yesteryear - like the A9 chip that powered the iPhone SE - to keep costs lower when many consumers won't need the extra grunt. But the iPhone SE’s chip would still offer significant speed improvements, while its f/2.2, 12MP camera could also make an appearance to improve image quality. We could also see the first Rose Gold iPad mini, if 'premium pink' shades of tablet are your thing. The Nexus 7 was the first device to really trouble Apple’s tablet dominance in 2012, and now it’s time for the slate to make a comeback under a different guise. According to early reports, the Google-branded Pixel 7 will be just one of a number of own-brand slates to come from the search giant in 2017, as it builds out its portfolio on the back of its Pixel smartphone offerings. Specs are still unclear, but we’d love to see the Pixel phone’s sleek, high-end design scaled up to tablet form and paired with some sharp QHD AMOLED display tech. The Pixel 7 is expected to run Android 7.1, while a larger Pixel C follow-up could be the first device to run Google’s rumored Android/Chrome hybrid operating system, Andromeda. The Surface Pro 4 is an impressive effort from Microsoft, and the brand's next effort looks set to be even more powerful. Tipped to run Intel’s seventh-generation Kaby Lake processor, the rumored Surface Pro 5 could be the ultimate tablet for Windows lovers. More than just a simple slate, this Surface Pen-compatible tablet will likely come bundled with a snap-on keyboard, making the Surface range even more attractive as an alternative to an existing laptop. If it's to truly become a notebook rival though, we really want to see the Surface Pro 5 lasting longer as battery life is key to making this tablet a productivity-focused must-have. It’s not just the tablet that’s set for an update. According to patent filings, the Surface Pen stylus could become rechargeable, as well as adding a new loop attachment that would keep the accessory locked to the tablet via a USB connection when not in use. Sony's not been part of the tablet market for a couple of years now, which makes sense given the turbulent times over in its handset division. The Xperia XZ maker could be ready for a slate-based return in 2017, with an oversized take on its latest flagship phone. However, this is mostly speculation, as rumors of the Xperia Z6 Tablet have gone cold of late, so it's only because Sony still could deliver a decent tablet experience that we're including it on this list. Like the company’s phones, Sony’s tablets could move to a new design and naming convention, keeping the slimline design and water-resistant body of Sony’s recent tablets, but perhaps going smaller and lower-spec (like the Xperia Z3 Tablet Compact) to keep costs a bit lower and more attractive. What we’d like to see is a few UI improvements compared with the Xperia Z4 Tablet, and improved internal storage - but Sony would need a real unique selling point to make its new device worth having, and we've not seen much word of that as yet.